Psoriatic arthritis is an inflammatory spondyloarthritis occurring in patients with psoriasis who are usually seronegative for rheumatoid factor. It is often included in a class of disorders called rheumatoid variants or seronegative spondyloarthropathies. Clinical Findings. The typical pattern of joint involvement in psoriatic arthritis is either characterized by arthritis of all finger joints (DIP, PIP, and MCP joints) resulting in a so-called dactylitis or sausage finger, as well as a transverse involvement of the DIP joints. In contrast to rheumatoid arthritis, the joint swelling is rather tight and the skin often shows a red livid coloration. Arthritis may appear after skin involvement, which is especially the case in children. Radiographically, the hallmark findings consist in both ankylosing ossification and destructive processes at the same time. Given this typical feature, diagnosis is often possible without skin involvement (Fig. 10.8). Nails may show so-called oil spots or onycholysis, particularly when distal joints of fingers or toes are affected. The typical course of psoriatic arthritis is characterized by episodes of highly acute disease and long-standing remissions. Involvement of the spine and the sacroiliac joints (mostly asymmetrical) is less frequent, as compared to ankylosing spondylitis. A distal interphalangeal arthritis is the most typical pattern of joint involvement in psoriasis. It is unsightly, but rarely disabling, and there is often adjacent nail dystrophy reflecting inflammation in the enthesis extending into the nail root. 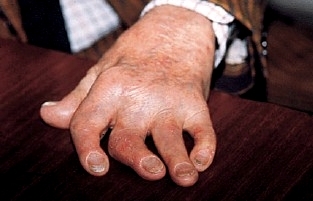 Cutaneous lesions, interphalangeal joint synovitis and tenosynovitis causing a ‘sausage’ finger or toe (dactylitis) are seen in pauciarticular psoriatic arthritis (and in reactive arthritis). * A seronegative symmetrical polyarthritis similar to rheumatoid arthritis also occurs. * Arthritis mutilans affects about 5% of patients with psoriatic arthritis and causes marked periarticular osteolysis and bone shortening (‘telescopic’ fingers) (Fig. 10.9), in which, despite the deformity, pain may be mild and function often surprisingly good. * Radiologically, psoriatic arthritis is erosive but the erosions are central in the joint, not juxta-articular, and produce a ‘pencil in cup’ appearance (Fig. 10.10). * A unilateral or bilateral sacroiliitis and spondylitis develops in 15% of patients with early involvement of the cervical spine; only 50% are HLA-B27 positive. • Usually gradual clinical onset. • Asymmetric involvement of scattered joints. • Selective involvement of the DIP joints. • Symmetric arthritis similar to RA in 15% of patients. • Possible development of predominant sarcoiliitis in a small number of cases. • Advanced form of hand involvement (arthritis mutilans) in some patients. • Dystrophic changes in the nails (pitting, ridging) in many patients with DIP involvement. Differential Diagnosis. 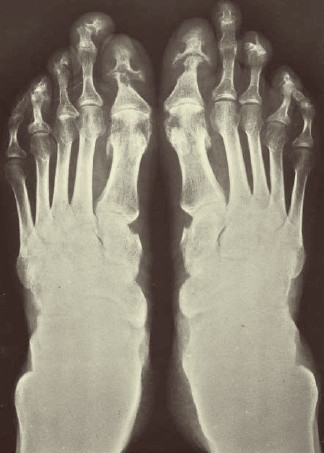 Similarities exist with rheumatoid arthritis (symmetrical pattern of joint involvement without affecting the DIP joints), osteoarthritis of the fingers (joint involvement preferentially of DIP and PIP joints), reactive arthritis (manifestation after intestinal or urogenital infection), as well as crystal arthropathies (joint fluid examination). • Early diagnosis may be difficult to establish because the arthritis may develop before skin lesions appear. • Laboratory studies show no specific abnormalities in most cases. • Slight elevation of ESR. • Possible HLA-B27 antigen (especially in patients with sarcoiliitis). Fig. 10.9 Hand showing psoriatic arthritis mutilans. All the fingers are shortened and the joints unstable, owing to underlying osteolysis. Fig. 10.10 X-ray of psoriatic arthritis. 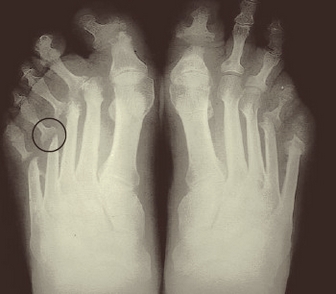 There is osteolysis of the metatarsal heads and central erosion of the proximal phalanges to produce the ‘pencil in cup’ appearance (circle). All the lesser toes are subluxed. • Peripheral joint findings similar to those in rheumatoid arthritis but erosive changes in the distal phalangeal tufts characteristic of psoriatic arthritis. • Bony osteolysis; periosteal new bony formation. • Changes in axial skeleton: sacroiliitis, development of vertebral syndesmophytes (osteophytes) that often bridge adjacent vertebral bodies. • Spinal changes: do not have same appearance as ankylosing spondylitis; however, spine abnormalities are less common than sacroiliitis. NSAIDs and/or analgesics help the pain but they can occasionally worsen the skin lesions. Local synovitis responds to intra-articular corticosteroid injections. In milder, polyarticular cases, sulfasalazine or methotrexate slows the development of joint damage. When the disease is severe, methotrexate or ciclosporin is given because they control both the skin lesions and the arthritis. Anti-TNF-a agents, e.g. etanercept, are highly effective and safe for severe skin and joint disease. Corticosteroids orally may destabilize the skin disease and are best avoided but are valuable when injected into a single inflamed joint. Rituximab has no role in treating psoriatic arthritis. The prognosis for the joint involvement is generally better than in RA. • Different from rheumatoid arthritis in both prognosis and response to treatment. • Generally, mild joint symptoms in psoriatic arthritis. • Disease-free intervals lasting for several years in many patients.